Could you please briefly outline the history of your company? “Stork was founded in 1865 in the Dutch town of Borne as the machine factory Gebr. Stork & Co, constructing equipment for the textile industry. 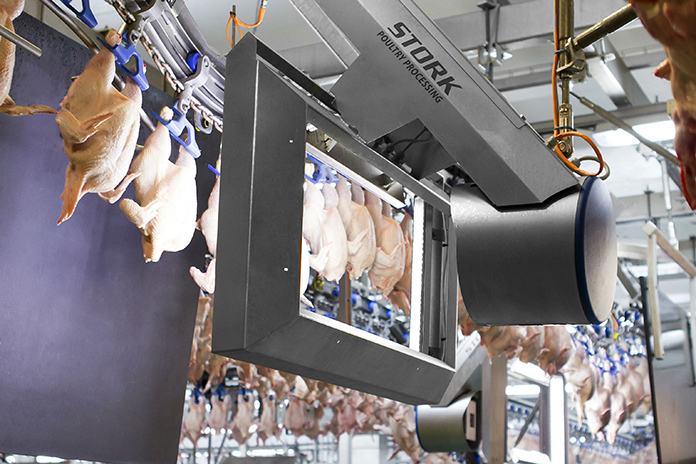 Growth and expansion continued in the 20th century and broadening its scope to numerous industries, Stork started manufacturing poultry machinery in 1977. Since 2008 Stork Food Systems is part of the Icelandic Marel company, which led to a name change in 2016. From then on, the company is known as Marel Poultry. 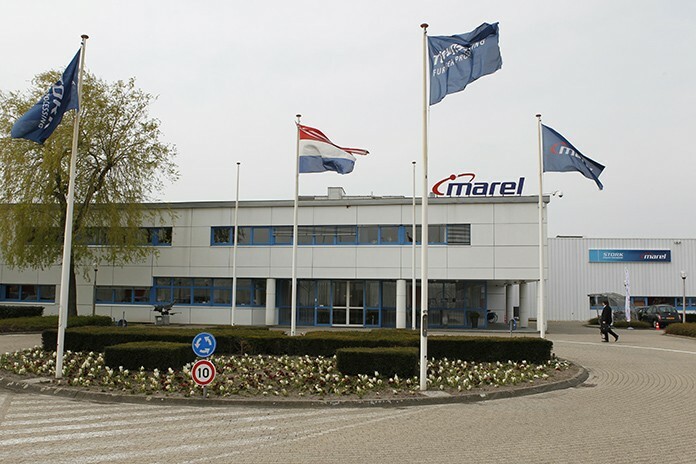 Nowadays, Marel serves the markets of poultry, fish and meat processing. It is present in 30 countries, with 17 manufacturing plants worldwide and employing 4,600 people”. Please describe your product range with specific reference to primary processing, portioning, packaging and ancillary installations including process control, waste water treatment and manufacture of by-products. “Marel Poultry has developed an impressive portfolio from single equipment to fully integrated solutions, which can respond to any poultry processing demand. With the most complete product range and the largest installed base worldwide, we supply innovative poultry processing equipment for broilers, turkeys and ducks. 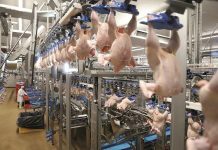 Inline poultry processing solutions for all process stages and all processing capacity levels at the desired automation level are available. Our product range includes top quality equipment from live bird handling up to stunning, scalding, plucking, evisceration, giblet processing, chilling, grading, cut-up, deboning, bone detection, portioning, batching, end-product logistics, process control software solutions and service contracts. All Marel Poultry systems are modular, can be combined with other equipment and with manual processes to compose semi-automated or fully automated poultry processing solutions, covering capacities from 500 to 13,500 bph. Among these solutions are many cutting-edge innovations, such as the CAS SmoothFlow stunner, the award-winning AeroScalder, the Nuova evisceration series, the combined early grading system with IRIS and award-winning SmartWeigher, the DownFlow Plus air-chilling technique and many more”. Marel Poultry’s I-Cut 122 is a high-speed, dual-lane, extremely accurate portion cutter with innovative cutting patterns and new vision control technology. What new products have you recently introduced or are you going to launch in the coming future? “We at Marel Poultry are committed to the sustainability of our systems and solutions, and we combine this with innovative concepts, always with respect for poultry, people and planet. Our Stork AeroScalder is a strong example of this. Prior to the process of plucking, scalding is necessary. Generally this process uses vast amounts of hot water. The innovative AeroScalder concept, however, manages to save up to 70% water and up to 50% energy as compared to using the standard scalding methods. Another innovation concerns the automation and acceleration of the entire inline process. A remarkable inline innovation in this respect is the maturation chilling, a process which both pre-chills and matures the products inline in such a way that it achieves excellent meat tenderness in a relatively short process time. Marel’s Innova software is also really innovative. This software opens up totally new worlds for effective poultry process management. Given the fact that a poultry plant can hold about 40,000 broilers from beginning to end of the process, the Innova software succeeds in determining exactly the whereabouts, the quality, the weight and the eventual product destination of each and every single broiler in the process. Marel Poultry will continue to introduce innovations, showing its technological leadership. Raised effectiveness and food safety are constant themes in this respect. That’s why focus is on overarching processes which make equipment intelligently communicate with each other, such as the so-called ‘Robot with a knife’. This is a new concept assuring the interaction between the I-Cut 122 (a brand new, high-speed, dual-lane, extremely accurate portion cutter with innovative cutting patterns and new vision control technology) and the RoboBatcher Flex to create a highly intelligent and efficient cutting and batching system”. The IRIS Intelligent Reporting and Inspection assesses whole products and its seven anatomic portions at multiple locations in the processing plant. Which are the areas of the world representing the greatest potential for growth? 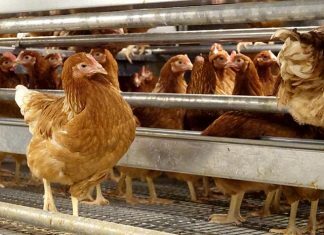 “It is expected that meat consumption in African countries will double by 2030, whereas Asia’s appetite for chicken meat is expected to account for 40 percent of growing world demand to 2023. For many African and Asian countries, there is a need for new developments, ideas, approaches and operators to increase the quality level of the meat sector. Main challenges to tackle are high costs of production, inefficient production methods, limited know-how on modern poultry keeping, lack of processing facilities, high energy prices and high priced domestic broiler meat, which has to compete with the cheaper imported poultry meat. As such, access to suitable technology and machinery for poultry processing is very important in developing the local meat sectors in Africa and Asia”. What are the main advantages your products offer to your clients? “We invest much more than the poultry industry average on innovation. To us innovation is more than a trendy word: It’s our passion, part of our DNA. Constantly we are striving to improve the poultry processing industry by integrating ground-breaking technologies. That’s how we develop many new cutting edge solutions and processes. They allow our customers – poultry processors worldwide – to add maximum value, to produce high quality end products and to strengthen their market share. In this way they can take a significant lead over the competition, especially in terms of sustainability and efficiency”. “Being the global technology market leader in poultry processing equipment, Marel Poultry is an extremely trustworthy partner to its relations all over the world. We bring poultry processors unmatched reliability and effective technologies with respect for people, birds and planet. Our highly qualified expert teams translate our passion for poultry processing into highest added value for customers around the globe”. “Marel Poultry maintains excellent contacts with leading universities, research institutes as well as progressive clients and relationships within the food industry. The intensive cooperation with these parties has boosted many innovative products made by Marel Poultry. The patent portfolio of over 250 granted patent families also accentuates this. Besides that, Marel Poultry has received numerous awards, such as the VIV Europe Innovation Award, the EuroTier Golden Innovation Award, and the AGRAme Award. This underlines the appreciation of the products and service delivered by Marel Poultry”. How do you think to provide services and technical advice to your clients in the various markets? “By linking global knowledge to local solutions, Marel Poultry can provide service at all levels and in all areas of the world. In the business of producing quality products, everyone wants to maintain the level of quality as long as possible. That’s why Marel Poultry offers well thought out service and maintenance schedules to ensure that equipment continues to run at optimum efficiency. Service packages can be customized to individual wishes, turning maintenance from a reactive effort to a proactive solution. In this way it is possible to achieve a lower total cost of ownership, guarantee throughput and obtain a higher yield per product. 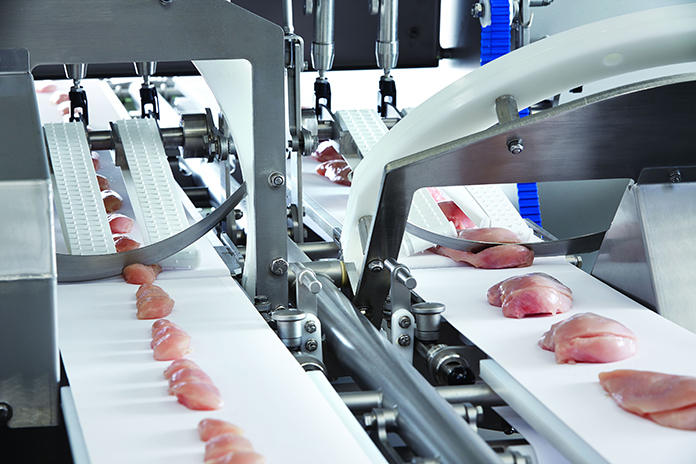 No matter at what location in the world, Marel Poultry makes sure a production line will keep running optimally and will remain competitive – something that only the original manufacturer can offer. Marel Poultry’s global network of around 40 offices always ensures local availability of the right service engineers at the right moment. Additionally, a help desk is operational 24 hours a day. This extensive service network ensures optimal uptime, customized SLAs and fast delivered OEM spare parts”. 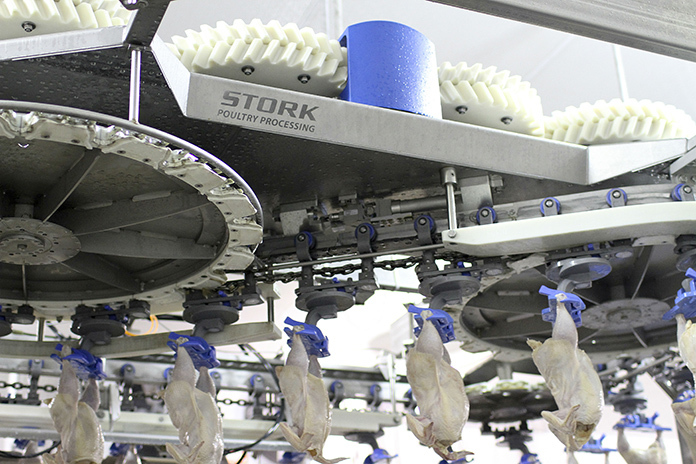 The Stork SmartWeigher is the award-winning whole product weigher that enables accurate inline weighing in the distribution line, after chilling. Which will be the main future challenges in your sector in the next years? “The coming years, sustainability, food safety and quick meal preparation will be important themes in the poultry processing industry. Equipment solutions have to be lean and mean to dynamically respond to changing consumer wishes. Marel Poultry is well prepared and well equipped to meet these challenges. Knowing that even the smallest local contamination in the food chain can have a global impact on food supply streams, hygiene and safety in food processing will become even more important than it is right now. 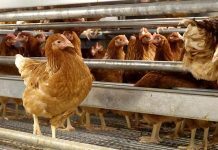 The main concern of Marel Poultry is to supply solutions which guarantee a hygienic production and which support poultry processors in delivering the safest possible food. Techniques for advanced tracking and tracing of every single product are crucial assets in this respect. Equipment and systems are carefully designed to prevent contamination at any stage of the process. By translating global expertise into local customized solutions, Marel Poultry knows how to respect cultural and religious regulations concerning animal handling, hygiene and meal preparation, thus making poultry meat available to all the people in the world. Marel Poultry’s look towards the future can be described as ‘Advancing food processing’. The coming decades, the world population will continue to grow. In order to provide all citizens with sufficient high-protein food, chicken meat – which is globally accepted – will be one of the main nutrition sources. In this respect Marel Poultry’s focus on high-speed, high-quality poultry processing makes sense. 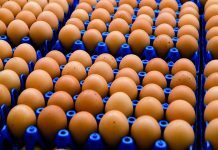 In the future, the current maximum line speed of 13,500 broilers per hour will accelerate considerably. That’s because large scale, industrial food processing is needed to respond to the expected massive increase in demand for protein-rich, affordable, healthy food”.